Joyce Hoffman "1994 Woman of the Year"
This is not the first time Joyce Hoffman has held this title. In 1965, she was named LA Times Woman of the Year, the only surfer to ever win this honor. 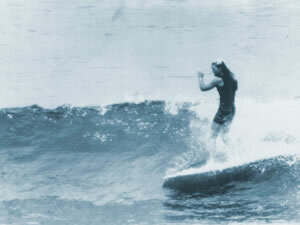 In 1966, at only 19, she was voted best woman surfer in the world (International Surfing Hall of Fame). From 1964 through 1966 she dominated! In 1965 she was unbeatable, winning the U.S. Women's championship (Huntington Beach), World Championship (Lima, Peru) and International Womens Surfing Championship (Makaha). But her competitive spirit didn't stop there. She went on to place 3rd Woman Motocrosser In the World, and raced 2-llter can am cars locally. Still surfing, most of her time now is spent at Hoffman Fabrics, a major supplier to surf clothing manufacturers.